In a small jar with a tight lid, add the sugar and food coloring. Shake until thoroughly combined. 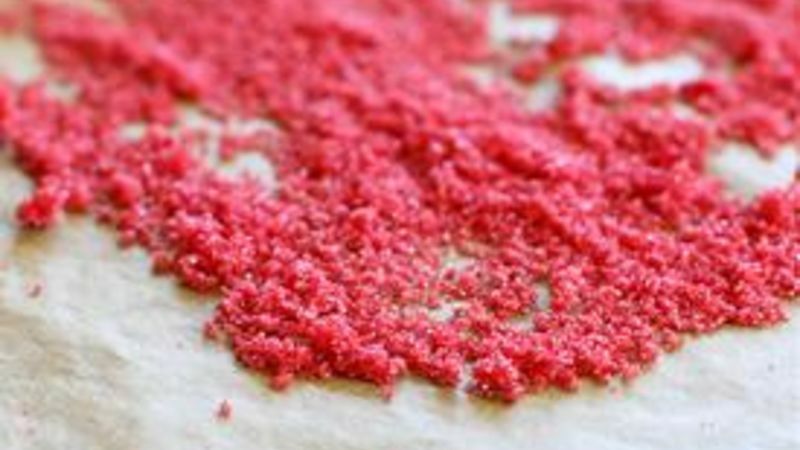 Spread colored sugar on a parchment-lined cookie sheet in an even layer. Bake for 5-10 minutes or until sugar starts to glisten (not too long, or it will melt!). Let mixture cool and sprinkle away! Glitter is pretty. Edible glitter is pretty and ... edible! This sugary glitter will add color and sparkle to your holiday goodies! Add a little sparkle and excitement to your holiday baking with this Edible Glitter. Red, blue, green, or pink -- any color is possible and takes hardly any time to make at all. One of our Christmas traditions is to make this Reindeer Feed to set out next to Santa's cookies for his hungry, hard working reindeer. In my opinion, magical reindeer only eat sparkling magical food, so glitter was a definite ingredient to add to the mix. Since we're not trying to kill off Santa's reindeer with regular craft glitter, edible glitter had to be made. Start by mixing some food coloring and sugar in a tightly sealed glass jar. You could also use a plastic bag here if you wanted. Get your booty into it and shake it until all of the food coloring is combined. Spread the colored sugar on a parchment-lined cookie sheet and bake at a very low temperature of 180 degrees. If you turn your oven any hotter, the sugar will turn into a big pile of liquid (don't ask how I know that). Let the glitter cool and you're ready to sprinkle away. Look how baking it brings out the shine and adds some glisten. I sprinkled some into my Reindeer Feed for a little extra magic!